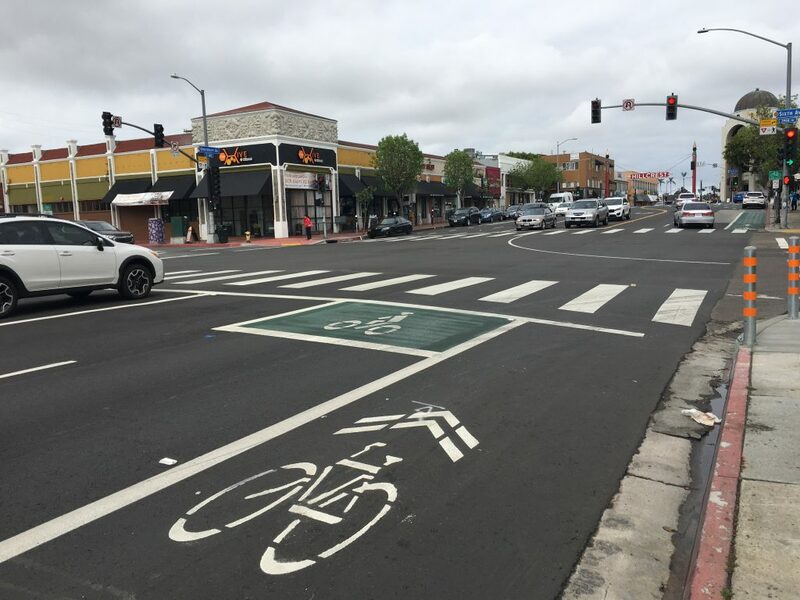 We’ve adapted a post by BikeSD which explains and illustrate bicycle infrastructure designs that are relevant to scooter riders and others in the mobility (or ‘low-speed’) lane. These are the designs we want to see on our streets. These are designs that provide solutions for rider safety and comfort. All of the infrastructure featured is from the NACTO Urban Bikeway Design Guide which “is based on the experience of the best cycling cities in the world.” And here at RideSD we want San Diego to have the best riding experience in the world! So let’s start with BIKE BOX. What is a bike box? If you google bike box, you will see a shipping box, but that is not what we are talking about. 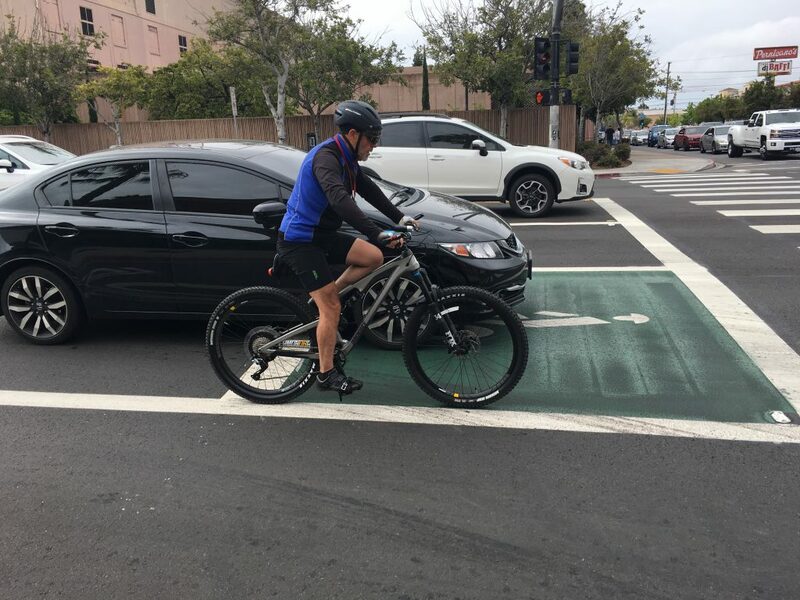 A bike box is a designated area (generally painted green) at the head of a traffic lane at a signalized intersection (an intersection with a stop light or traffic light.) It provides low-speed road users with a safe and visible way to get ahead of a line of traffic during the red signal phase (when the light is red.) Nearly all the benefits of a bike box are related to increased safety for riders. But, there are some benefits to motorized vehicles that come from using bike boxes. A bike box increases VISIBILITY of people riding scooters, bikes and other mobility devices. There are things that riders do to make themselves visible such as wearing bright clothing and using flashing lights. Being visible is key to bicycling safety. A bike box on the street helps bicycles be more visible at intersections. The bright green painted box highlights a location and motorists can expect to see someone on a mobility device in that location. A bike box decreases the chance of a RIGHT HOOK which is a leading cause of both car vs bike/scooter and car vs pedestrian crashes. A right hook dangerous crash that involves a vehicle turning right into the path of a pedestrian or a bike/scooter going straight. Bike boxes can help prevent this kind of crash because mobility riders are positioned at the front of motor vehicles at the intersection. A bike box provides PRIORITY for low-speed riders at signalized intersections of major streets. Groups of riders together can clear an intersection quickly, minimizing impediment to transit or other traffic. This priority has benefits for motorized vehicles because the people riding in the bike box clear the intersection more quickly than a line of bikes/scooters, so right turning traffic moves through the intersection more quickly.